Planning for the future can seem daunting, but a new local financial services company is here to make the process easier. 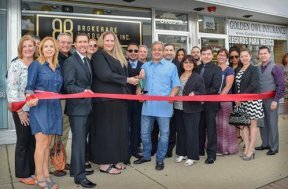 Located at 6903-A W Cermak Rd, Brokerage Resources Inc. is an independent, Illinois-based financial services company offering a range of insurance products catered to both individuals and business owners. A ribbon cutting was held in partnership with the City of Berwyn and the Berwyn Development Corporation (BDC) on August 7, 2017. Headed by President Angela Gambino and Vice President Miguel Contreras, who both bring over 21 years of life and health insurance experience to the table, the Brokerage Resources team is dedicated to providing exceptional customer service and higher-quality care at lower costs. Brokerage Resources offers the following services: retirement planning strategies, insurance planning, business planning strategies, legacy planning strategies, Medicare supplement, Medicare Advantage, Medicare Part D Plans and Social Security exploration. They also offer no-obligation financial reviews. No matter which service the client needs, Brokerage Resources operates on a carefully guided 4-step process: (1) They discover each clients’ plans through fact finding and goal setting; (2) They help clients get organized with meetings, recommendations and developing financial strategies; (3) They implement the plans and strategies, providing clarification along the way; and (4) Finally, they monitor clients’ plans through ongoing reviews and making modifications. Connect with Brokerage Resources online at GambinoBR.com, via email at angela@gambinoBR.com or via phone at (708) 637-4480.